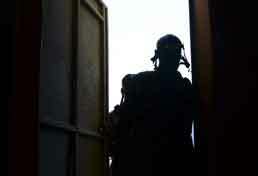 A Djiboutian soldier enters a dark building during a night vision goggle training exercise conducted by U.S. Army trainers in Djibouti City, Djibouti, Oct. 10, 2016. The Djiboutian troops prepare for a two-year deployment to Somalia, as part of the African Union Mission in Somalia’s effort to remove al-Shabaab from the region. Photo: Staff Sgt. Benjamin Raughton/U.S. Airforce See larger photo and full story. WASHINGTON — The Obama administration has intensified a clandestine war in Somalia over the past year, using Special Operations troops, airstrikes, private contractors and African allies in an escalating campaign against Islamist militants in the anarchic Horn of Africa nation.